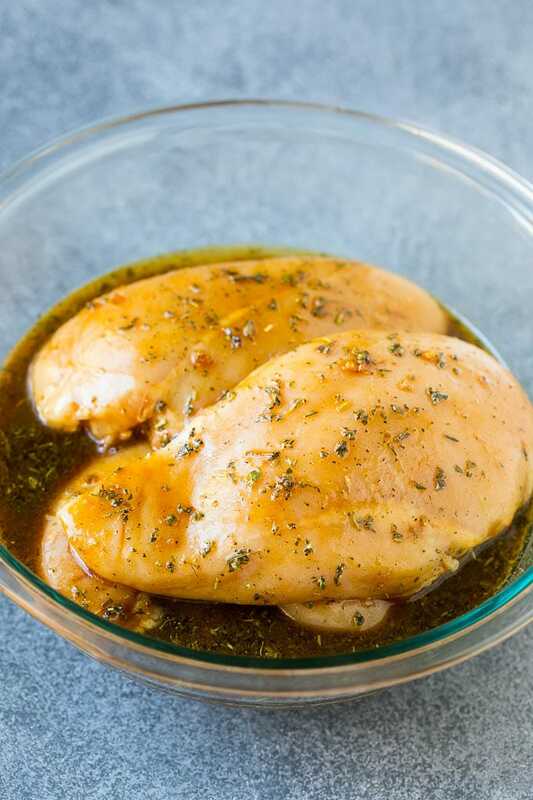 This chicken marinade is a blend of garlic, herbs, olive oil, soy sauce, brown sugar and Dijon mustard. It produces perfect marinated chicken every time, and you can use your chicken marinade for baked, broiled, grilled or sauteed chicken. Every cook needs a chicken marinade in their recipe box, and this is the best one I’ve ever had! Serve your chicken with rice pilaf and parmesan zucchini for a complete meal that the whole family will love. 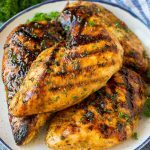 In the summer I am all about grilling, and I make this amazingly delicious chicken marinade at least once a week. It takes just minutes to put together and uses ingredients that you probably already have in your pantry. 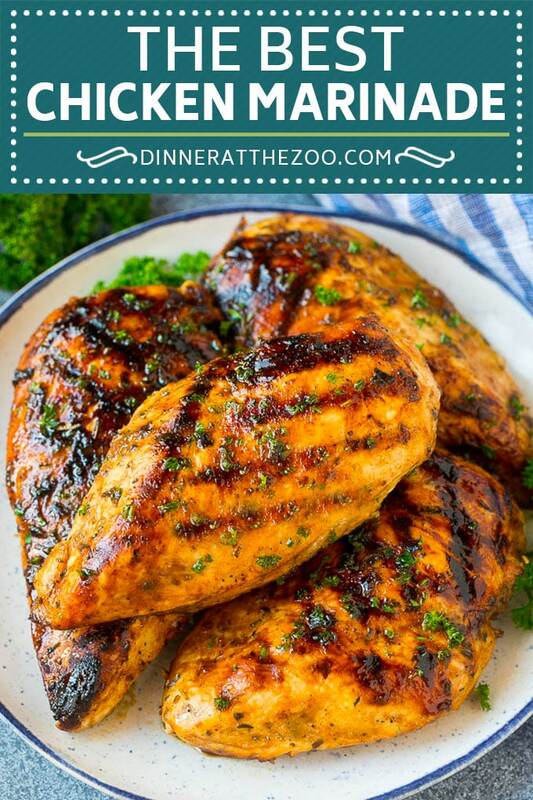 This marinade produces tender, juicy and flavorful chicken that will earn you rave reviews! HOW LONG DO YOU MARINATE CHICKEN? Chicken should be marinated for a minimum of one hour for boneless, skinless cuts. If you use a bone-in, skin-on cut, you’ll want to marinate for at least 4 hours. I typically marinate my chicken for about 8 hours to get the best flavor. This marinade can be made up to 3 days before you plan to use it. Simply store the marinade in the fridge until you’re ready to add your chicken. 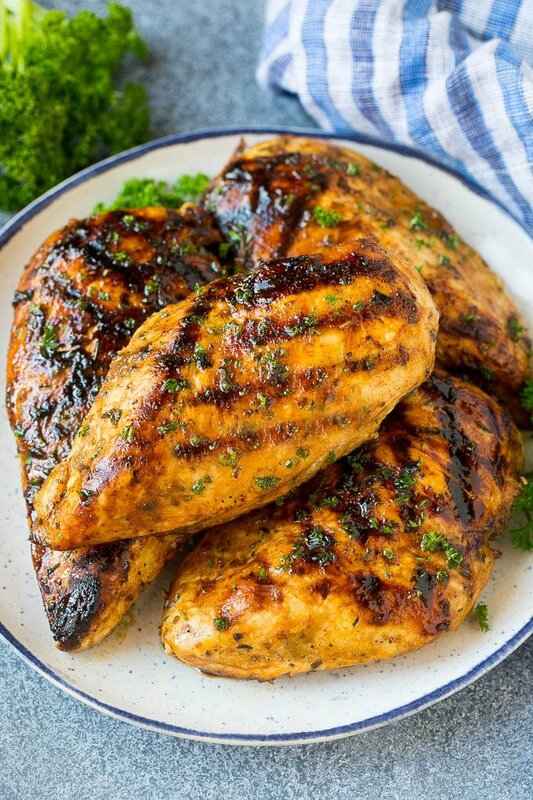 You can really use any cut of chicken for this marinade such as boneless skinless breasts or thighs, chicken tenders, or even chicken drumsticks. 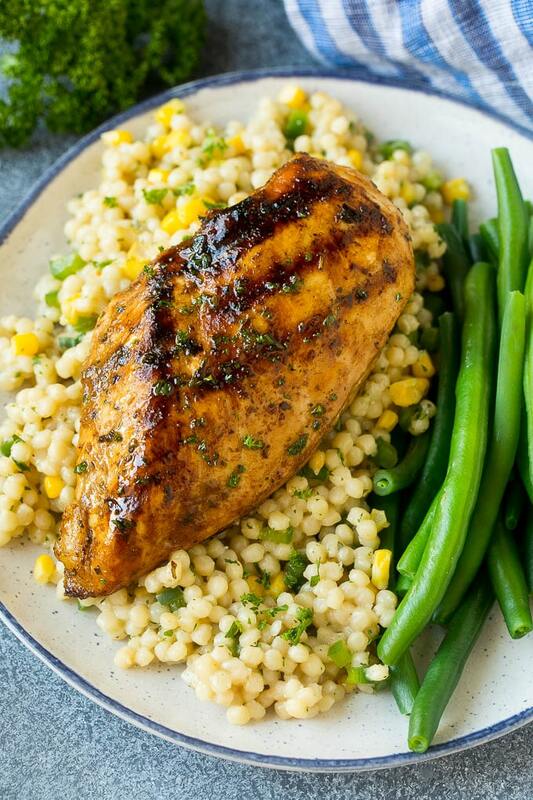 This marinade contains sugar which adds great flavor, but can easily burn on the grill. 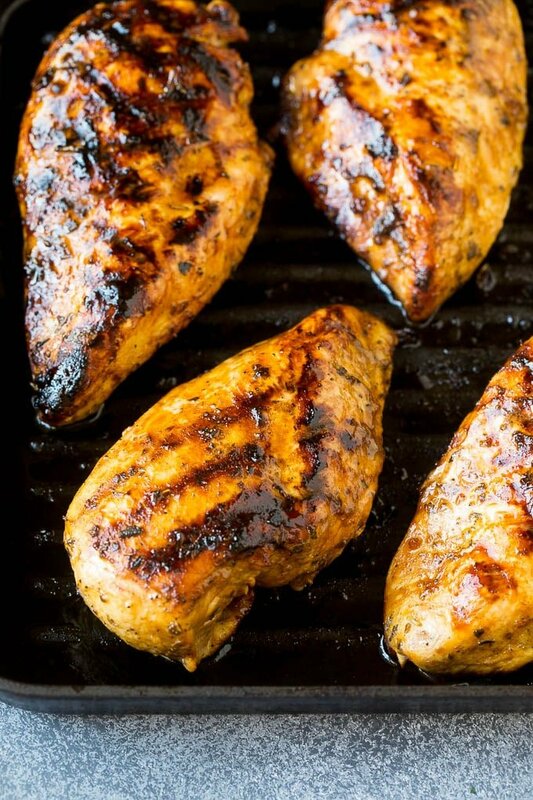 Make sure your grill is not overly hot before you add your chicken! Herb Lover’s: Add 1/4 cup fresh chopped herbs such as thyme, green onions, rosemary or parsley. Scrape off the large pieces of herbs before you cook your chicken. Mexican: Use the marinade recipe listed here. My favorite way to cook marinated chicken is on the grill. If the weather isn’t nice enough for outdoor grilling, I use an indoor grill pan on the stove. If you prefer, you can bake or saute your chicken. I recommend baking your chicken if you’re using bone-in cuts such as drumsticks or chicken thighs. WHAT TEMPERATURE SHOULD CHICKEN BE COOKED TO? All cuts of chicken should be cooked to an internal temperature of 165 degrees F. The easiest way to gauge if your chicken is done is to insert a thermometer into the thickest part of the chicken – be sure that the thermometer is not touching the bone! Once you’ve reached the correct temperature, remove the chicken from the heat and let it rest for 3 minutes before you slice it. 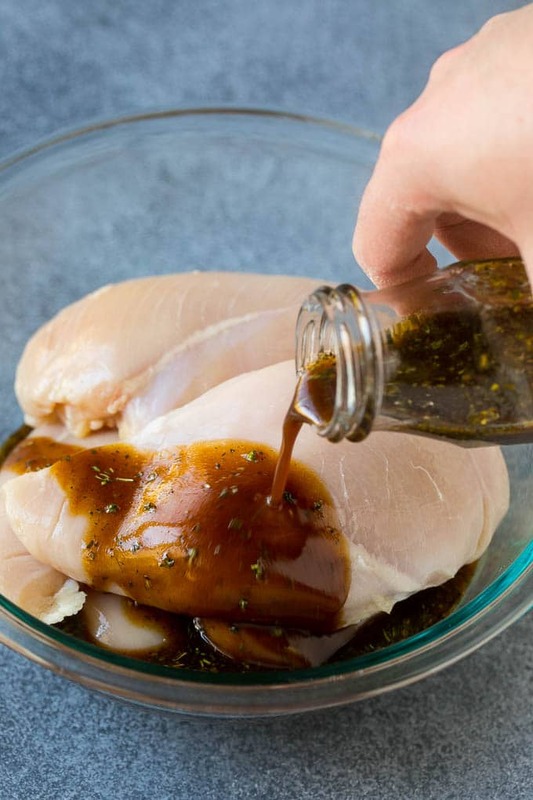 Once you try this chicken marinade recipe, you’ll find yourself using it constantly! I make marinated chicken almost every week and my family happily devours it. Even the kids love this one! Add 2-3 pounds of chicken, then marinate for at least 1 hour, or up to 12 hours. This looks incredibly delicious! I gotta make this! Looks great! Have you ever tried adding Braggs Amino’s to your marinade? It adds such a great flavor!! Its one of my secret ingredients! I’ll try it next time, thanks for the tip! Such a great recipe to have in your repertoire. Love the flavors in this marinade! So, so yummy! I want to try this chicken marinade asap. It looks so good! This marinade sounds faaantastic!! YUM! That chicken looks delicious! I love a great marinade and can’t wait to try this one! I LOVE the sound of this one!!! What a great recipe that for sure I won’t get bored of! I’ve always got chicken on hand so I cannot wait to give this one a try! Very cool the way it recalculated the recipe. Did t realize it did that! As there is only self and my hubby can I do smaller quantity or maybe freeze some. You can change the number of servings in the recipe card, just type in the number in the little square and the recipe will re calculate for you!